THE anguish and horror of a series of bomb explosions in mid-air have thankfully been averted. The diabolical plot to carry or plant liquid explosives in handbags on board several trans-Atlantic flights could only have come from a group or groups with hatred so all-consuming that they have ceased to be human. Such terrorists cannot lay claim to any religion, ideology or lofty goals of any kind whatsoever — their aim is only to kill and be killed. RAJYA SABHA chairperson Bhairon Singh Shekhawat and Lok Sabha Speaker Somnath Chatterjee have ruled what was apparent to even a layperson: the leak of the Justice R.S. Pathak Enquiry Authority report did not amount to any breach of privilege of Parliament. Where is the money to pay? JUST when the Punjab finances had started improving comes the report about a new pay commission, that too within days of a similar Central announcement. The last pay commission had left Punjab bankrupt. For years most of its revenue had to be spent on salaries, pension and debt repayments. Loans taken for wheat and paddy crops were used to pay staff salaries. Development had suffered and the once fastest-growing state faced the ignominy of seeing its growth rate slip below the national average. The end result may not be different this time also. On August 14-15, 1947, when the larger family of the British Indian Army (BIA) was split up between India and Pakistan, the former inherited a highly disciplined, deeply steeped in tradition, thoroughly apolitical and highly experienced band of soldiery second to none in the world. I grew up as a child in Army cantonments where my father, then a Major, was serving in a famous cavalry regiment — Hodson’s Horse, now called 4 Horse — and many years later counted myself as being fortunate in being commissioned into this very regiment and rising to become its Commandant and Colonel-Commandant. The former princely state of Patiala was one of the pioneer promoters of sports in general and cricket in particular. The cricket ground in Baradari Garden with lush outfield has been witness to many famous matches of national and international levels played here. Is a partition of Iraq in the offing? They have a new constitution, a new government and a new military. But faced with incessant sectarian bloodshed, Iraqis for the first time have begun openly discussing whether the only way to stop the violence is to remake the country they have just built. THE anguish and horror of a series of bomb explosions in mid-air have thankfully been averted. The diabolical plot to carry or plant liquid explosives in handbags on board several trans-Atlantic flights could only have come from a group or groups with hatred so all-consuming that they have ceased to be human. Such terrorists cannot lay claim to any religion, ideology or lofty goals of any kind whatsoever — their aim is only to kill and be killed. It is to the credit of the British security apparatus and that of any community, country or international agency which may have assisted them with vital information, that they have averted what would have been a tragedy of enormous magnitude. Once again, the planned attack underscores the fact that terrorism is no longer specific to any region or place and it is a threat humankind faces. India is still recovering from the Mumbai train blasts which killed over 200 people. Not only was there no timely intelligence, the police is still groping in the dark as to the exact identity of the perpetrators and their commanders, though they have leads which suggest a Pakistani connection. Pakistan blithely rejects the fact that terrorism continues to be sponsored from its soil, with intelligence, money and training support. Repeated calls to adhere to past commitments to stop such aid are met with the standard query, “where is the evidence?” Reports indicate that there is a clear Pakistani link to the planned attacks in the UK. Even if Pakistani agencies were involved in passing on vital information, as some reports point out, Pakistan definitely does not show the same alacrity and willingness when the targets are not Western, but in India. It is time the international community steps up pressure on Pakistan to act against all elements of the terrorist network. The US and Europe cannot afford to be complacent about Pakistan’s limited support to their war on terrorism, since it appears to be paying dividends as far as terror attacks on their own soil is concerned. Such a strategy would be ill-advised, something even UK Prime Minister Tony Blair acknowledged recently. The chances of it backfiring are high. As long as known extremists are allowed to freely roam about and pursue their agenda, the threat will remain. It is time to break the stranglehold. RAJYA SABHA chairperson Bhairon Singh Shekhawat and Lok Sabha Speaker Somnath Chatterjee have ruled what was apparent to even a layperson: the leak of the Justice R.S. Pathak Enquiry Authority report did not amount to any breach of privilege of Parliament. With this, former External Affairs Minister K. Natwar Singh lost an opportunity to tell the world how lily white he was despite all the proof the Authority had unearthed about his involvement in the oil-for-food scam. He could also have used the occasion to berate his erstwhile colleagues in the Cabinet who, he believes, are responsible for putting him in the dock. In retrospect, he and his foes-turned-supporters in the Opposition who kicked up a shindy over the breach of privilege and wasted the precious time of the Houses in protest owe an apology to the nation. Privileges of Parliament and its members are meant to help them in discharging their duty to the people. They are not meant to shield the shenanigans of those who head official delegations to foreign countries and use the opportunity to fix business deals for their relations. As we had noted in these columns, the government did not have any particular reason to leak the contents of the report. In fact, by promptly presenting it along with its own action taken report to Parliament, the government dispelled all fears that it had anything sinister up its sleeves. If, in spite of this, Mr Natwar Singh and others did not withdraw the breach of privilege motions, it only exposed their shortsightedness. The rulings provide a sense of relief to the government. However, neither Mr Natwar Singh nor his son is entitled to any such relief as the government is committed to acting on the recommendations of the Justice R.S. Pathak Authority. The government has assured Parliament that the report would be referred to the Enforcement Directorate and other agencies to take appropriate action if they have violated the laws of the land. The cases should be investigated in as thorough a manner as possible without fear or favour so that in future nobody in power dares to mix public function with private gain. JUST when the Punjab finances had started improving comes the report about a new pay commission, that too within days of a similar Central announcement. The last pay commission had left Punjab bankrupt. For years most of its revenue had to be spent on salaries, pension and debt repayments. Loans taken for wheat and paddy crops were used to pay staff salaries. Development had suffered and the once fastest-growing state faced the ignominy of seeing its growth rate slip below the national average. The end result may not be different this time also. That the decision is election-oriented is obvious. There are four lakh government employees who are also voters. Pampering of employees is not confined to salaries or raising the retirement age to 60. The administration and the police are both top-heavy and promotions are not always rule-based. When the law limited the ministry size, the government appointed MLAs as parliamentary secretaries. Examples of extravagance and misutilisation of resources are legion. Loss-making boards and corporations have got MLAs as chairmen. Education and health have suffered for lack of staff, infrastructure and funds. The other day the Chief Minister boasted at a “vikas rally” that Punjab was the only state in the country to have deposits of Rs 2,203 crore with the RBI. More taxes, especially the VAT, have boosted Punjab’s revenue. The VAT introduction required the abolition of all local taxes, including octroi. That has not happened. Salaries and pensions go up in tandem with growth. If the state has surplus funds, why does it ask for a Rs 2,059-crore package for farmers from the Centre? The fruits of development should be evenly distributed. The employees who perform deserve higher salaries in keeping with the rising cost of living, but the corrupt and non-performers should be shown the door. People expect a helpful and efficient administration in return for taxes they pay. After a service span of 35 years with a varied experience, both in India and abroad, and with the Army in recent times coming in for some adverse notice, it becomes necessary to dispassionately and honestly carry out a realty check to gauge the true intrinsic worth of this sword-arm of the country today. A small backgrounder is essential, one feels, to comprehend the evolution process of the Army. Divided up in manpower (the Muslims by and large went away to Pakistan), equipment and financial support, the young Indian leadership of the likes of Brig K.M. Carriapa and a few others who were seniormost at the time quickly assumed charge and took care to face the challenges of Partition as best as they could. The Army was a small organisation at that time, but so was the one in Pakistan. After the British Commander-in-Chiefs had relinquished charge on both sides of the border, the first major challenge that we faced was in 1965 when our own top military leadership had matured and greyed immensely, and men like Lt-Gen Harbaksh Singh had proved their mettle. The war against China was, of course, ill thought of, hastily executed and carried out by an ill-provisioned Army that was still basking in the rhetoric of Hindi-Chini Bhai Bhai. The top brass of the Army then did not have the courage to tell Nehru that more time and preparation were needed to plan an equal confrontation. The 1971 masterly victory was again overshadowed by an intelligence mess-up in Kargil where the performance of many of our senior commanders left plenty of room for introspection and improvement. It has to be accepted that a proud and competent Army outfit can only deliver that much as its leaders on top demand, and also exhibit by personal example, both in moral and physical terms. So, this shortcoming then would raise the basic question of the intake into the Army, both at the officer and jawan level. It has to be admitted that today for many it has become just a question of employment like any other job. Is our standing Army of a million then a mercenary organisation, or is it a force where there are those who come to it for their love of the uniform and all the glory (not the money) that it still brings with it. Unfortunately, most of those in search of high salaries and an easy life place the Army at the bottom in their career options. With the country in the grip of unemployment, it is not that difficult so far as the jawan’s entry is concerned, though I dare say that the material coming in from certain parts of the country is not the very best for the Service. The officer cadre, by and large, goes under-subscribed and it is the lack of respect among the public, fewer arrangements for comfort, the diminishing of family traditions, a liberal intake from the humbler strata of society and better avenues elsewhere where no risk is involved, that are some of the main reasons for this state of affairs. The government needs to look into this aspect urgently. The proliferation of para-military and central police forces and their copying the Army’s insignia, rank badges and uniform have not been to the liking of anyone in the Army. The lowering of the order of precedence on ceremonial occasions, political interference from time to time in the selection and appointment of senior officers, a deficiency in understanding that the Army performs in a hostile and difficult environment and with virtually no role in the policy planning formulations at the higher level, in the Ministry of Defence, have adversely affected the standing and popularity of the Army today. One is not suggesting that we should not move with the times, or stick religiously to the traditions of the British Army. Yet the best that a sense of tradition provided — self-discipline, service before self and undying loyalty to the unit and the system inherited by us — must not be allowed to wither away. Possibly, somewhere the training syllabus of the officer cadre seems to have been diluted, for otherwise we would not have had our civil courts being approached by officers seeking redressal. As regards the bureaucracy, it must understand that it and the Army are on the same side of the fence as the two services carrying out the wishes of the government, but not as unequals and superiors and subordinates, which unfortunately happens to be the case with a few honourable exceptions. Yet in all this enforced coexistence over the years, the tasks of the protection of the external borders, internal security, and assisting in natural and unnatural calamities have all been carried out to the satisfaction of the government without fuss. In a nuclear or conventional conflict environment, the Army stands ever ready to do its bit. So also in peace-keeping missions abroad, or in the service of the nation in quasi-military and diplomatic assignments. The high-tech age has brought about many necessary changes in our Army, but we would do well to bolster up the tank and mechanised profile, especially India’s Main Battle Tank. Even in a democracy like ours, heavens will not fall if we have a retired General or its equivalent in the other two Services as Defence Minister for a fuller understanding of the ethos and needs of the Services. Only they will understand what it is like for the wives and children to live in separated family accommodation, the loneliness that sets in when husbands are away for years in high altitude and field areas, and what challenges a young widow faces when the bread-earner has died in operations. On another plane, there is a pressing need to streamline the financial back-up systems in the Ministries of Finance and Defence, so that there is no time-lag in the execution of military projects, R&D and the acquisition of essential spares. Also, unless the government looks seriously and humanely at the post-retirement employability of soldiers and the officers where new jobs commensurate with the experience and status attained over the years are assured, there is little chance of the Army being anyone’s first choice. Having seen armies around the world and how well they are looked after, we in India need to make our Services more attractive for youth. A separate Standing Pay Commission for the armed forces is strongly recommended. If the government can look into all these aspects vigorously, there is reason and justification for keeping on the standing Army that we today are blessed with. If not, then there is need to examine going in for a smaller army like that in Israel with Reservists and others called in during a country-wide mobilisation. But bigger issues of conscription are involved here which the average Indian may not find to his liking and, therefore, the legitimate needs of the Army should be expeditiously gone into. And the country will get the Army it deserves. The former princely state of Patiala was one of the pioneer promoters of sports in general and cricket in particular. The cricket ground in Baradari Garden with lush outfield has been witness to many famous matches of national and international levels played here. The doyen of Indian Cricket, the late Lala Amar Nath, was the pivot and guide of the Patiala team which had eminent players and even Maharajas of Patiala would participate in the matches. It was during 1945 when I was selected to represent the Mohindra College cricket team and had to participate in matches in this majestic ground that I would invariably see a middle aged gentleman clad in spotless white shirt and pants riding a bicycle with a Remington typewriter placed in the carrier of the bike heading towards the pavilion. He would be warmly welcomed by the management and invariably provided with a prominent seat with a table on which the typewriter would immediately be placed. I came to know that he was a journalist. Since the latest technology was unknown 60 years back, he would type out his impressions of the match and each page would be taken by his assistant to the telegraph office for onward transmission to The Tribune, which was then published from Lahore. This exercise would continue till the last ball was bowled. The poignancy of the memory is as keen as ever even after the lapse of so many years. My curiosity to meet this powerful man from the media increased every day especially when I realised that he was a colourful personality and man of many parts. He was not only a journalist with strong independent attitude but also a keen cricket player and a freedom fighter who was awarded Tamra Patra. Very soon he earned the name of “Journalist on Wheels”. I was face to face with him when he came to play a friendly match to the college ground with our team. He was a member of our rival team. While batting I lofted his flighted offspin to the boundary but the next ball clean bowled my stumps — he smiled! It was during lunch when I went to seek his blessings that he patted me and gave some useful tips to improve my batting. Next morning I saw that he had mentioned my name in his report in The Tribune. That was my first news about sports which not only touched me but also inspired me to do better. There is another powerful recollection which stands out. We had formed the “students Congress” group in the college and decided to take out a procession. Holding flags in our hands, we were shouting “up up National Flag” and “down down Union Jack” in the bazaars of Patiala. I noticed that our esteemed journalist had quietly joined us. That was a burning topic in the college next day. Shri R.S. Azad, the “Journalist on Wheels”, is no more with us. However, his love for cricket runs in the blood of his dear son D.P. Azad, who not only made a name as a player but also as a coach giving many outstanding and eminent players to the country, including the cricketer of the Millennium, Kapil Dev. His contribution was recognised by the government by conferring Dronacharya Award. Once he confided in me that the crisp comments in The Tribune had greatly helped him to reach this level. This is emblematic of what is happening in Amritsar’s once famed government-owned, teaching and medical care facilities. Good doctors are leaving in frustration. Amritsar Medical College has a sprawling campus with several heritage buildings. Yet, it languishes without adequate staff, medical equipment and funds. And, for that matter, without many patients. They are going elsewhere for treatment. The movement of patients away from the government hospitals to private ones is not only because of the user charge that is now levied on them, though that is often pointed to as the sole reason. The truth is that the quality of the care that they can hope to get in these places has dwindled drastically. Confidence levels are at an all-time low. Care in private establishments is expensive, and the poor are getting priced out of them. Those who are a little better off get by, unless the treatment required is of very specialised kind. Amritsar thus may not be losing all its best doctors. But the changes that are happening are fundamentally challenging the existing models of government-aided medical care, and, indeed, of medical education. Government apathy, an unresponsive bureaucracy, and a lack of will, too, are playing their part. On the premises of Sri Guru Tegh Bahadur Hospital, Dr Baljit Singh Dhillon, Chairman of the Punjab State Medical and Dental Teachers Association, points to a 115-year old foundation stone. It bears the date November 1891, and the name it started out with – Victoria Jubilee Hospital. The hospital was attached to the Medical School at Lahore, which was begun in 1864, and was intended to provide clinical training to its students. In 1920, the school itself shifted to Amritsar, to be upgraded two decades later into a full-fledged college. “These are wards where I spent my early years as an MBBS student,” says Dr Dhillon. The hospital is now in a shambles, particularly because of a plan to shift most of the departments to the larger Guru Nanak Dev hospital. Today Guru Tegh only houses the sexually transmitted diseases, gynaecology, and psychiatry departments. Wards are barely functional, with patients lying on rickety beds under rickety fans. The corridors are surprisingly clean, but that is all that can be said about the wards. Doors and windows look ready to fall apart, and the rain has seeped through in many places. The private and family wards are not occupied – they cost a few hundred rupees a day and patients seem to believe they are not worth the money. The high ceilings and quaint fireplaces could have been charming and even contributing to convalescence, but not with dirty and broken down bathrooms, and the beds, walls, ceilings and windows in disrepair. In the general ward, there are still students from the Amritsar Medical College (AMC) visiting. The AMC’s woes are well known and the students’ tales echo the same — staff shortage, poor staff quality barring some, poor infrastructure and equipment, and low patient inflow. The students’ eager, intelligent faces barely hide their disenchantment. “Why can’t they improve the infrastructure,” they ask plaintively. Across the road, is the Radiotherapy unit, where there is a silver lining – but in danger of being tarnished if action is not taken. The hospital received, three months ago, the handsome sum of Rs 2 crore from the Cancer Association of India. The money is for the purchase of a “Rotating Cobalt Unit” for cancer treatment. But the purchase has not been initiated yet. The radiotherapy unit is to be shifted to Guru Nanak Dev hospital. “We need Rs 1.79 crore for a building for the unit. The Punjab Government has not yet given us the amount. The Cancer Association will give us another Rs 3 crore for additional radiotherapy equipment, but only if we utilise this money. If it lapses, it is gone. They won’t give it to us again,” notes Dr Dhillon. The cancer treatment is free. No user-charges are levied on the patients. Similar tales of opportunities lost and resources wasted abound at the Guru Nanak Dev hospital as well. 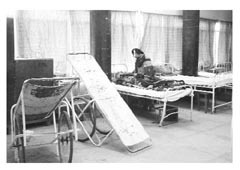 The large, spacious hospital was set up in 1974 on 114 acres of land. You would expect a 500-bed government hospital to be buzzing with doctors, nurses, patients and their relatives, and a general hum of activity. But there is only a general dullness. A CAT scan machine, costing about Rs 1.5 crore, has not been functional for the last two and a half years. Ask the attendants whether it is working, and you will only get an embarrassed giggle. “Some one has just taken out an ICU or two. That is the end of it,” says a doctor. There is no sign of any will to get it up and working. The intensive care units are depressing. But for the piped oxygen and a modicum of isolation, it could be the general ward of a hospital, dirty bathrooms and all. In the general wards, rickety beds are propped up on bricks and patients’ relatives sit around, sometimes three on a single broken bed. The much-touted 500-bed figure hides something else – this hospital does not have a single private ward. Not that, as at Guru Tegh Bahadur hospital, it would make a difference in the current state of affairs. The bed-occupancy ratio tells its own tale. In the Tuberculosis facility, once a resort like sanatorium, a 250-bed capability today caters to a mere 50 people. “Maybe, we will get a little more if the government can spare some money for food for our patients. We have kitchens and pay salary to resident cooks, but there is no money for atta and subzi,” says a doctor there. Given its sanatorium origins, of an earlier philosophy of caring for TB patients, the trees, the grass and the red-brick buildings could have actually been put to good use. The sad tale continues at the new buildings coming up at Guru Nanak Dev Hospital. Supposed to be an emergency block, it was started off in 1992 at a projected cost of Rs 3.5 crore. It was subsequently touted as a `Super Specialty’ block. It has now crossed Rs 14 crore, with more to go. Completion is still nowhere in sight. On paper, there is a Rs 3-crore sanction for medical equipment that can follow if the building is completed. The prognosis is not good. “True, terrorism saw the beginning of the deterioration of the facilities. But now the government should shake itself out of its stupor. It is as if we are on the border, so we don’t matter. Look at Lahore on the other side. It is so well developed,” laments Dr Dhillon. It is clear that what is going wrong in Amritsar is not so much a shortage of resources as sheer wastage, corruption and a succession of missed opportunities. Given the real estate that the medical institutions are sitting on, and a priceless heritage, it can do much better. But without political direction and vision, and a lack of imagination, these institutions will continue to suffer in terminal malaise. Leaders of Iraq’s powerful Shiite Muslim political bloc have begun aggressively promoting a radical plan to partition the country as a way of separating the warring sects. Some Iraqis are even talking about dividing the capital, with the Tigris River as a kind of Berlin Wall. Shiites have long advocated some sort of autonomy in the south on par with the Kurds’ 15-year-old enclave in the north, with its own defense forces and control over oil exploration. And the new constitution does allow provinces to team up into federal regions. But the latest effort, promulgated by Cabinet ministers, clerics and columnists, marks the first time they have advocated regional partition as a way of stemming violence. The growing clamor for partition illustrates how dire Iraq’s security, economic and political problems have come to seem to many Iraqis: Until recently, Iraqis shunned the idea of redrawing the 8 1/2-decade-old map of Iraq as seditious. Some of the advocates of partitioning the country are circumspect, arguing that federalism is only one of the tools under consideration for reducing violence. But others push a plan by Abdel Aziz Hakim, head of the Supreme Council of the Islamic Revolution in Iraq, a political party. Hakim advocates the creation of a nine-province district in the largely peaceful south, with 60 percent of the country’s proven oil reserves. Sunni leaders see nothing but greed in the new push – the Shiites, they say, are taking advantage of the escalating violence to make an oil grab. Iraq’s oil is concentrated in the north and south, with much of the Sunni west and northwest desolate desert tundra, devoid of oil and gas. Still, even nationalists who favor a united Iraq acknowledge that sectarian warfare has gotten so out of hand that even the possibility of splitting the capital along the Tigris, which roughly divides the city between a mostly Shiite east and a mostly Sunni west, is being openly discussed. “Sunnis and Shiites are both starting to feel that dividing Baghdad will be the solution,” despaired Ammar Wajuih, a Sunni politician. Critics scoff at the idea that any geographical partitioning of Sunni and Shiites will make the country any safer than it is now. In fact, some observers warn that cutting up the country’s Arab provinces into separate religious cantons would be as cataclysmic as the partition of Pakistan and India in 1947. One Western diplomat, who spoke on condition of anonymity, suggested that the Shiites were using the prospect of a southern mini-state to gain other political concessions from Sunnis, “a threat that they wouldn’t want to have to exercise” because tearing the country asunder would be so traumatic. A U.S. Embassy spokesperson declined to comment publicly on an issue so volatile. But U.S. policymakers have also begun to warm to the idea. Sen. Joseph Biden of Delaware, one of the Democratic Party’s leading voices on foreign policy, began openly advocating such a move this year. The tragic death of Mr Lalit Narain Mishra and the injuries caused to 16 others, including his brother, Dr Jagannath Mishra, in the Samastipur bomb explosion have shocked the nation. No one had the right to raise a violent hand against him and those who have done it — whatever forces they represent — stand condemned. It is hoped that they will soon be brought to book and made to pay for their dastardly crime. Political issues have to be dealt with on the political plane. The resort to violence is not only reprehensible for the human suffering that it causes but is also a wanton attack on the spirit of democracy and all civilised values. The challenge has to be met. It is not a law and order problem to be solved by the administration alone. The political leaders who are now vying with one another in deploring the Samastipur outrage should realise that it calls for not merely platitudes but serious heart-searching among them all. The cut of violence does not sprout spontaneously. It is fed by a certain temper in political debate and social relations, and by a sense of despair and helplessness in the face of economic distress. Wild allegations and loose talk of “bloody revolution” nourish the cult. So also unruly scenes by elected representatives who ought to behave. In such a climate of hate the bomb and the gun begin to take the place of the arguments of reason. And it so happens that to warped minds “character assassination” appears to be a step towards physical assassination. The wise king does not seek war. He seeks first to converse, to dialogue, to parley. For a war destroys more than the king. It also decimates the hapless population, the cattle and the fields full of grain. (O you who believe) be maintainers of justice, bearers of witness for Allah even though it be against your own selves or (your) parents or near relatives. O the Inner-knower of all hearts! All living beings belong to you. Visit not miracle-mongers and those who exhibit occult powers. These men are stragglers from the path of Truth.